One of my favorite games way back in the day of the Commodore 64 was Ultima II. Yes, I know, it was among the least of the Ultimas, but for its time it was a masterstroke. A touch of that off-the-wall humor is in omega, which keeps some of the format but loses some of the seriousness of its brethren. omega mixes a weird recipe of fantasy and science fiction elements, along with a few touches of contemporary culture too. So while it also adds an environment beyond the archetypal dungeon fetch quest, it also has a bank with ATM cards, a gladiator arena, a fast food joint that sells fried lizards by the bucket, and a few other oddball touches. omega has a few high points and a few low points, from my cursory examination. The opening city offers more than enough entertainment for quite a while. Dungeons are out there, in the wilderness, but that doesn’t mean you can’t keep yourself busy in the shops, bars and arenas in the city. omega also adopts the “play yourself” format that was popular around the late 1980s, where you answer a dialog to determine “your” character statistics and play as you. On top of that, omega offers a number of different ways to “win,” some of which are simply to become successful in some sort of in-game organization. Look at the overview in the help pages if you are seeking an alternative ending. Its inventory system is the right way to do things, with specific slots and carrying spaces that are occupied by objects. It’s not nearly as comprehensive as, for example, the intricacy of cataclysm (where you can actually choose how to layer your clothes, to afford yourself more pockets), but its a practical improvement over endless lists of accumulated crud. On the downside, that inventory system is a little kludgey to navigate, in my opinion. Each slot can be filled, but if you want to move items between locations, shuffling things becomes cumbersome. omega also seems strapped for screen space, trapping dialogs in the first three lines of the screen, plus a flashing “MORE” prompt, but occasionally has to take over the lower part of the screen — or all of the right side — to display lists or logs. 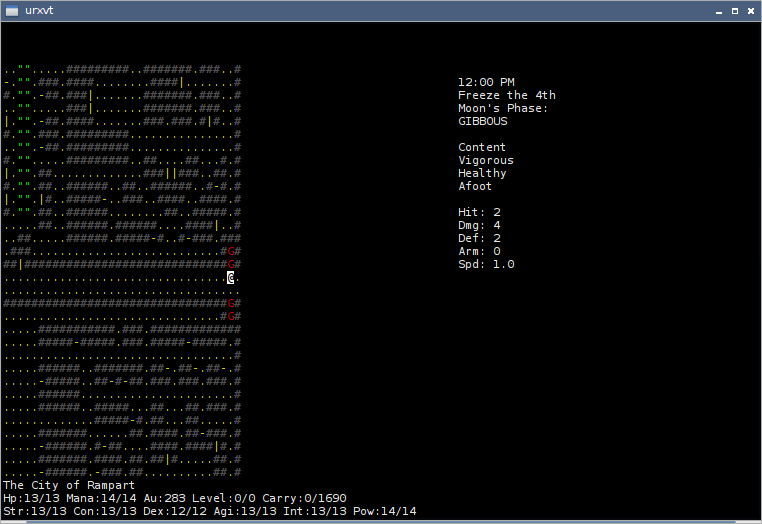 Compare that with something like angband, and there’s definitely a conservation-of-space issue to be solved in omega. A few other issues: Sometimes the game uses arrow keys, sometimes it uses the HJKL sequence. Wilderness travel will require you to carry about six or seven buckets of fried lizards to reach a dungeon. The backspace key isn’t available when naming your character, which means I have one or two personas named Km^GM^G^G^G^D^G^G^D^G. The map will display characters or items that you can’t examine because they’re out of your line of sight … but they’re on your map, so … ? The title page for omega suggests it dates back to 1987, but the version I have comes from the AUR, and links back to this Github page. Apparently though, other renditions exist. Take your pick. Perhaps some of those avoid the issues I listed above. This entry was posted in Linux and tagged game on 2014/10/24 by K.Mandla. Check ZAPM, I found that on the Nethack’s tournaments site . 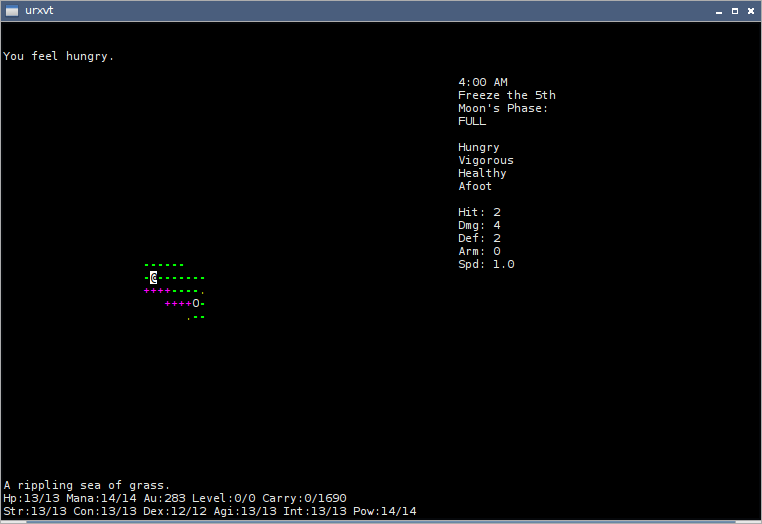 It’s like Quake/Doom on roguelike.